Professional version of advanced slider with multiple hotspots per slide for WooCommerce/Wordpress. Unlimited number of sliders, slides and hotspots. Each hotspot can be linked to product in WooCommerce store or to any URL, providing true shop the look experience for customers. 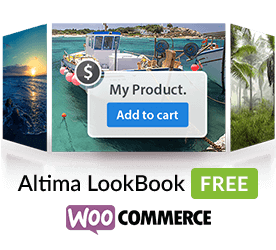 Professional version our lookbook slider extension for WooCommerce/Wordpress stores. Help your customers visualise what they purchase from you. When you purchase WooCommmerce Lookbook Professional you define your production and development domains. The plug-in will work on this domains only. If you have multiple stores with different domain you need to buy extra licence. For volume purchase - contact us.